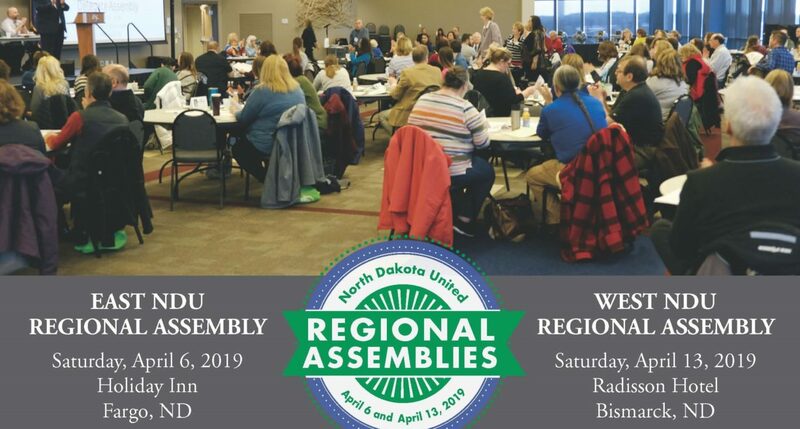 The NDU West Regional Assembly will be held on Saturday, April 13, at the Radisson Hotel in Bismarck. Delegates to the Regional Assemblies will vote for the offices of President, Vice Presidents of Education and of Public Employees, NEA Director and our NDU delegates to the National Education Association’s Representative Assembly. Additionally, will host a legislative forum, an NEA training on implied bias, organizing and communications trainings, a North Dakota Public Employee Retirement System (NDPERS) update, and more. Each local is guaranteed at least one representative. Larger locals are allowed one per 50 members. Please complete and return the Regional Delegate Report Form ASAP but no later than March 29 (E) or April 5 (W). Each local should have received an email from Ellie Sharbono with your specific information. Social & Registration• A social and registration will be held Friday evening (April 5 in the East; April 12 in the West) at the hotel, starting around 7 p.m.
East — Holiday Inn Fargo (3803 13th Ave S., Fargo, ND 58102) Phone: 877-282-2700. West — Radisson Hotel (605 E Broadway Ave., Bismarck, ND 58501) Phone: 701-255-6000. Contact the Radisson by March 29 to receive the negotiated rate of $83.70 + tax single; 95.10 + tax double. Please contact kathy.gourlay@ndunited.org if you have any questions.